Although some 170,000 Irishmen served during the American Civil War, it is extremely difficult to gain a picture of what service was like for them across a broad spectrum. This is a symptom of the fact that for the majority of Irish troops their wartime experience occured outside ethnic Irish units. I have been considering for some time how to meaningfully address this, in order to explore a range of men from across different branches of the military. With that in mind I have decided to delve further into the lives and experiences of the Irish-born men who were awarded the Congressional Medal of Honor for actions during the American Civil War. 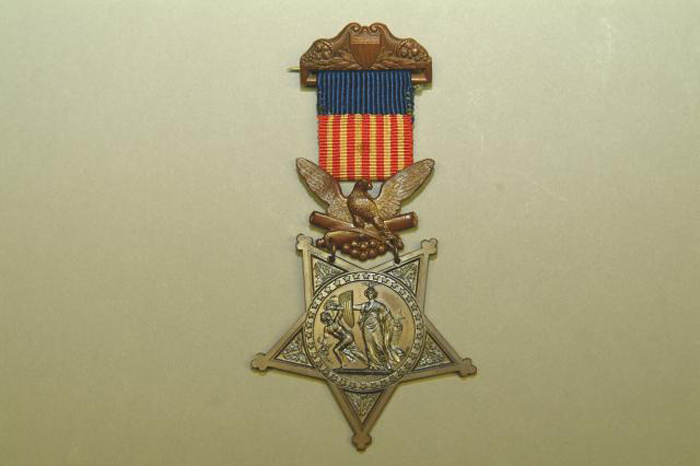 To date 146 Civil War Medal of Honor recipients have been identified as Irish-born. Of this number, fewer than twenty served in what might be called ethnic ‘Irish’ regiments (although others undoubtedly served in Irish companies). All branches of the service are represented among their number, which encompasses the infantry, artillery and cavalry and crosses the regular/volunteer divide. It also includes fifty naval recipients, an area where little study of the Irish has taken place. Although not without its limitations, examining these 146 men as a group offers a window into the wider Irish experience of the conflict. Were they married, if so when and where, did they have children? 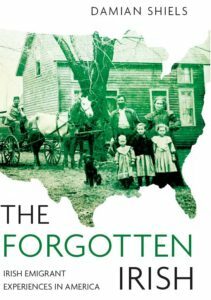 Where did they live in the United States before and after the war? What was their pre and post-war occupation? What was the nature of their wartime service? Were they injured, maimed, killed during the conflict? Did they suffer from physical or psychological trauma in post-war years? Were they remembered/honoured for their service or award during their lifetime? Did they record any of their experiences in the post-war years, and if so what do they reveal? Were they active in the GAR/Medal of Honor societys and did they attend reunions? When and where did they die and where are they buried? How are they remembered today (if at all)? I expect that this list of research questions will grow over time, and clearly for many of the men it will not be possible to answer many of the queries posed. In order to undertake the project I will be looking at sources such as pension records, census information, service details, unit histories and contemporary newspapers, among others. The project is ambitious, but if even partially successful would fulfill a desire I have long held to look at a range of Irishmen and their families across a wide spectrum of wartime experience. I hope that readers can be of assistance in this undertaking, by spreading the word regarding the project; I am also eager to receive any information you may have that you think may add to it, all of which would be greatly received (and fully acknowledged in any project output). I am also interested in hearing your thoughts regarding the current research questions and suggestions on any you feel might be added. I am looking forward to getting started! The current list of known Irish-born Medal of Honor recipients is below. I will soon be adding a dedicated page to the site specifically for the project- if you would like to contact me concerning it please email me at irishamericancivilwar@gmail.com. Allen, James 16th NY Inf. South Mountain, Md. Anderson, Robert Keokuk Charleston, S.C.
Bass, David L. Minnesota Fort Fisher, N.C.
Begley, Terrence 7th NY Hvy Arty. Cold Harbor, Va.
Blackwood, William 48th PA. Inf. Petersburg, Va.
Brannigan, Felix 74th NY Inf. Chancellorsville, Va.
Brennan, Christopher Mississippi Fts. Jackson & St. Philip, La. Brosnan, John 164th NY Inf. Petersburg, Va.
Brown Jr., Edward 62nd NY Inf. Fredericksburg, Va.
Burk, Michael E. 125th NY Inf. Spotsylvania, Va.
Burke, Thomas 5th NY Cav. Hanover Courthouse, Va.
Campbell, William 30th OH Inf. Vicksburg, Miss. Carey, Hugh 82nd NY Inf. Gettysburg, Pa.
Casey, David 25th MA. Inf. Cold Harbor, Va.
Cassidy, Michael Lackawanna Mobile Bay, Al. Colbert, Patrick Commodore Hull Plymouth, N.C.
Collis, Charles H.T. 114th PA. Inf. Fredericksburg, Va.
Conboy, Martin 37th NY Inf. Williamsburg, Va.
Connor, Thomas Minnesota Fort Fisher, N.C.
Connors, James 43rd NY Inf. Fisher’s Hill, Va.
Cooper, John Brooklyn Mobile Bay, Al. Corcoran, Thomas E. Cincinnati Vicksburg, Miss. Cosgrove, Thomas 40th MA. Inf. Drury’s Bluff, Va.
Creed, John 23rd IL. Inf. Fisher’s Hill, Va.
Cullen, Thomas 82nd NY Inf. Bristoe Station, Va.
Curran, Richard 33rd NY Inf. Antietam, Md. Delaney, John C. 107th PA. Inf. Dabny’s Mills, Va.
Donoghue, Timothy 69th NY Inf. Fredericksburg, Va.
Doody, Patrick 164th NY Inf. Cold Harbor, Va.
Doolen, William Richmond Mobile Bay, Al. Dougherty, Michael 13th PA. Cav. Jefferson, Va.
Dougherty, Patrick Lackawanna Mobile Bay, Al. Downey, William 4th MA. Cav. Ashepoo River, S.C.
Drury, James 4th VT. Inf. Weldon Railroad, Va.
Dunphy, Richard D. Hartford Mobile Bay, Al. English, Edmund 2nd NJ Inf. Wilderness, Va.
Fallon, Thomas T. 37th NY Inf. Williamsburg, Fair Oaks, Va. Flood, Thomas Pensacola Fts. Jackson & St. Philip, La. Flynn, Christopher 14th CT. Inf. Gettysburg, Pa.
Ford, George W. 88th NY Inf. Sailors Creek, Va.
Fox, Nicholas 28th CT. Inf. Port Hudson, La. Gardner, William Galena Mobile Bay, Al. Gasson, Richard 47th NY Inf. Chapins Farm, Va.
Ginley, Patrick 1st NY Light Arty. Reams Station, Va.
Gribben, James H. 2nd NY Cav. Sailors Creek, Va.
Harrington, Daniel Pocahontas Brunswick, Ga.
Havron, John H. 1st RI. Light Arty. Petersburg, Va.
Highland, Patrick 23rd IL. Inf. Petersburg, Va.
Horan, Thomas 72nd NY Inf. Gettysburg, Pa.
Hinnecan, William Agawam Fort Fisher, N.C.
Horne, Samuel B. 11th CT. Inf. Fort Harrison, Va.
Howard, Martin Tacony Plymouth, N.C.
Hudson, Michael Brooklyn Mobile Bay, Al. Hyland, John Signal Red River, La. Irwin, Patrick 14th MI. Inf. Jonesboro, Ga.
Jones, Andrew Chickasaw Mobile Bay, Al. Jones, William 73rd NY Inf. Spotsylvania, Va.
Kane, John 100th NY Inf. Petersburg, Va.
Keele, Joseph 182nd NY Inf. North Anna River, Va.
Kelley, John Ceres Hamilton, N.C.
Kelly, Thomas 6th NY Cav. Front Royal, Va.
Kennedy, John 2nd US Arty. Trevilian Station, Va.
Keough, John 67th PA. Inf. Sailors Creek, Va.
Kerr, Thomas R. 14th PA. Cav. Moorefield, W.Va.
Lafferty, John Wyalusing Roanoke River, N.C.
Laffey, Bartlett Marmora Yazoo City, Miss. Logan, Hugh Rhode Island Mobile Bay, Al. Lonergan, John 13th VT. Inf. Gettysburg, Pa.
Madden, Michael 42nd NY Inf. Masons Island, Md. Mangam, Richard C. 148th NY Inf. Hatchers Run, Va.
Martin, Edward S. Galena Mobile Bay, Al. Martin, James Richmond Mobile Bay, Al. Martin, William Varuna Fts. Jackson & St. Philip, La. McAdams, Peter 98th PA. Inf. Salem Heights, Va.
McAnally, Charles 69th PA. Inf. Spotsylvania, Va.
McCarren, Bernard 1st DE. Inf. Gettysburg, Pa.
McCormick, Michael Signal Red River, La. McEnroe, Patrick H. 6th NY Cav. Winchester, Va.
McGough, Owen 5th US Arty. Bull Run, Va.
McGowan, John Varuna Fts. Jackson & St. Philip, La. McGraw, Thomas 23rd IL Inf. Petersburg, Va.
McGuire, Patrick IL Light Arty. Vicksburg, Miss. McHale, Alexander U. 26th MI Inf. Spotsylvania, Va.
McHugh, Martin Cincinnati Vicksburg, Miss. McKee, George 89th NY Inf. Petersburg, Va.
McKeever, Michael 5th PA. Cav. Burnt Ordinary, Va.
Molloy, Hugh Fort Hindman Harrisonburg, La. Monaghan, Patrick 48th PA. Inf. Petersburg, Va.
Montgomery, Robert Agawam Fort Fisher, N.C.
Moore, Charles Marblehead Legareville, S.C.
Morrison, John G. Carondelet Yazoo River, Miss. Morton Charles W. Benton Yazoo River, Miss. Mulholland, St. Clair A. 116th PA. Inf. Chancellorsville, Va.
Murphy, Dennis J.F. 14th WI. Inf. Corinth, Miss. Murphy, John P. 5th OH. Inf. Antietam, Md. Murphy, Michael C. 170th NY Inf. North Anna River, Va.
Murphy, Patrick Metacomet Mobile Bay, Al. Murphy, Thomas C. 31st IL. Inf. Vicksburg, Miss. Murphy, Thomas J. 146th NY Inf. Five Forks, Va.
Nolan, John J. 8th NH Inf. Georgia Landing, La. Nugent, Christopher Fort Henry Crystal River, Fl. O’Beirne, James R. 37th NY Inf. Fair Oaks, Va.
O’Brien, Peter 1st NY Cav. Waynesboro, Va.
O’Connell, Thomas Hartford Mobile Bay, Al. O’Dea, John 8th MO. Inf. Vicksburg, Miss. O’Donnell, Menomen 11th MO. Inf. Vicksburg, Miss. Platt, George C. 6th US Cav. Fairfield, Pa.
Plunkett, Thomas 21st MA. Inf. Fredericksburg, Va.
Preston, John Onieda Mobile Bay, Al. Quinlan, James 88th NY Inf. Savage Station, Va.
Rafferty, Peter 69th NY Inf. Malvern Hill, Va.
Rannahan, John Minnesota Fort Fisher, N.C.
Reynolds, George 9th NY Inf. Winchester, Va.
Riley, Thomas 1st LA. Cav. Fort Blakely, Al. Roantree, James S. Onieda Mobile Bay, Al. Robinson, John H. 19th MA. Inf. Gettysburg, Pa.
Robinson, Thomas 81st PA. Inf. Spotsylvania, Va.
Ryan, Peter J. 11th IN. Inf. Winchester, Va.
Scanlan, Patrick 4th MA. Cav. Ashepoo River, S.C.
Schutt, George Hendrick Hudson St. Marks, Fl. Sewell, William J. 5th NJ Inf. Chancellorsville, Va.
Shields, Bernard 2nd WV Cav. Appomattox, Va.
Spillane, Timothy 16th PA. Cav. Hatchers Run, Va.
Stewart, Joseph 1st MD. Inf. Five Forks, Va.
Tobin, John M. 9th MA. Inf. Malvern Hill, Va.
Toomer, William 127th IL. Inf. Vicksburg, Miss. Tyrrell, George William 5th OH. Inf. Resaca, Ga.
Urell, M. Emmett 82nd NY Inf. Bristoe Station, Va.
Walsh, John 5th NY Cav. Cedar Creek, Va.
Welch, Richard 37th MA. Inf. Petersburg, Va.
Wells, Thomas M. 6th NY Cav. Cedar Creek, Va.
Welsh, Edward 54th OH. Inf. Vicksburg, Miss. Welsh, James 4th RI Inf. Petersburg, Va.
White, Patrick H. IL Light Arty. Vicksburg, Miss. Williams, William Lehigh Charleston, S.C.
Wilson, Christopher W. 73rd NY Inf. Spotsylvania, Va.
Wright, Robert 14th US Inf. Chapel House Farm, Va.
What a fantastic concept! If I happen across any relevant info, I’ll be in touch. Many thanks Patrick, I appreciate it! Damian, WOW what a project, good luck with it. I will get with the American Legion hisorian on the West coast and see if he can help. Keep up the great work. That is excellent many thanks for that! I will keep you up to speed with developments! What an undertaking! I have some information on Sgt Plunkett (my cousin, 4 times removed) but there is already a lot of information on line. I thought his mother was Catherine Fitzpatrick but she was actually an aunt and my side of the family is descended from her. I have a family tree and dates, etc. So when you have something started for him, another cousin and myself could fill in some blanks. Thanks for the comment! I am fascinated by Sergeant Plunkett so will let you know when I am looking at hime in more detail- I have a brief story about him in my new book out this March you may be interested in, but it is probable you have much more to add! Hello. I just found your page. My Great-Great-Great-Great Grandfather was a soldier in the Union army during the Civil war. Born in Ireland, emigrated to NYC. Many thanks for posting! Do you have hims name and regiment? It may be possible for us to find out a bit more about his service- have you looked into it in much detail yourself? I lost my own copy of our family’s history but my cousin is providing me with info. There is a Patrick Cooley listed as a Private in the 43rd New York, I wonder could that be him? My Husband is a direct descendent of John Joseph Creed, 23rd Illinois Inf. John Creed’s pension record’s, which I have are a wealth of information and tell a sad story of his short life after the war. I have done quite a bit of family research on him. Many thanks for getting in touch! I would love to hear more about John- what was his eventual call of death? John Creed died on November 28, 1872 at his home in Illinois. A carpenter by trade before the war, he was wounded on April 2, 1865 in the attack upon Fort Gregg at Petersburg, Virginia. Corp. John Creed was the Color-Corporal and bore the colors during the assault. He was shot in both arms. He never regained his health, was afterward a cripple and his death was hastened from the wounds he received. His pension records have letter after letter from Military Captains, Doctors, friends and his wife as they tried to get Catherine Creed, his wife an increase in pension for her. On the day of John Creed’s death, his wife tried to get a passing Doctor to come in the house and help him. The Doctor wanted a payment of $100 dollar’s. Catherine did not have that large amount of money. The Doctor left the home so Catherine sent her young daughter to the Office of the Relief and Aid Society with the Medal which Congress had granted to John Creed for bravery in the field. A doctor was sent but John Creed died before he could get there. The story of John Creed’s life and death mean a great deal to us and we want to remember him for all future generations. He is my husband’s 2nd Great Grandfather. Many thanks for this excellent information, what a heart-rending story. John was not alone among Irish Medal of Honor recipients to suffer greatly in later years, it is very sad, particularly after all they had given. I am certainly going to have a detailed look at John Creed- the trials of his life and his bravery deserve to be remembered. What became of his wife and daughter in the years after his death? John Creed’s wife lived in Illinois until around 1889 and then moved to St Paul, Minnesota to live with her daughter Annie and Annie’s family. Catherine’s other daughter Margaret, my husband’s great grandmother also moved to Minnesota and married there. Catherine Creed moved back to Illinois in 1910 and died on Feb. 1, 1911. She was 96 years old. She is buried next to her husband John Creed in the Calvary Cemetery, Chicago, Illinois. Annie is also buried there with her husband and 3 of her children.